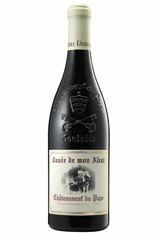 With no Mon Aieul made in 2011, all the best fruit has gone into this classic cuvée, and a very fine effort it is too. The blend is 80% Grenache, 10% Syrah, 5% Cinsault, 5% Mourvèdre and ageing has been shared between cement and wood, that is to say tank and foudre. A superb and warming wine, with a herbal nose, what follows is a luxuriant palate with dark fruit and a savoury undercurrent. 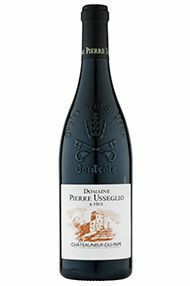 We often buy the wine from Pierre Usseglio but do not always put it into our printed offer, for fear of engendering confusion. To have two domaines named Usseglio in the village is slightly surprising in itself, surreal even; the high quality of both makes it even more so. On reflection, it is logical however, as both branches are from the same Italian vinous scion and both were clearly very well taught. Brothers Thierry and Jean-Pierre’s domaine is in the shadows of the ruins of the pope’s castle but their 25 hectares are spread widely over the five communes and the wines are seldom far from the lime-light. One hundred percent old-vine Grenache, Mon Aieul is an old-vine power-house, its 15 degrees of alcohol worn relatively lightly, its purity and power entirely as a result of the quality of the fruit, as there is no oak in its up-bringing; one for the longer term, this will strut and fret for a few years before a most poignant maturity. 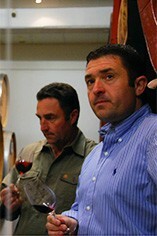 The Usseglio scions in Châteauneuf-du-Pape are nothing if not complicated; the names of both Domaines allude to the second generation but it is now the third generation in charge, in this case Thierry and Jean-Pierre….the wines, thankfully, are easy to understand; traditional of persuasion, the property describes itself as a ‘Maison de Grenache’ a house which is attempting to make wines that are as silky as they are robust.